The following NPC's are those that will join you on your quest at some point in the game. The only two optional characters will be pointed out in their respective sections. Found: Endar Spire Command Section. Mandatory. Trask will join you during the tutorial phase of the game, and will be your guide for the first map of the game. He leaves permanently at the end of the map. His higher level and hit point total means that he should probably lead the party for the first portion of the game. Since there are not enough XP for him to level up during this time, leveling strategies are irrelevant. Feats: Two-Weapon Fighting, Improved Two Weapon Fighting, Blaster Pistol Focus, Blaster Pistol Specialization. Carth will join you as you first wake up on Taris. If your character has low VP or is not designed for hand to hand combat you may wish to stick Carth in the lead with a melee weapon for the first portion of Taris, until you get Zaalbar. 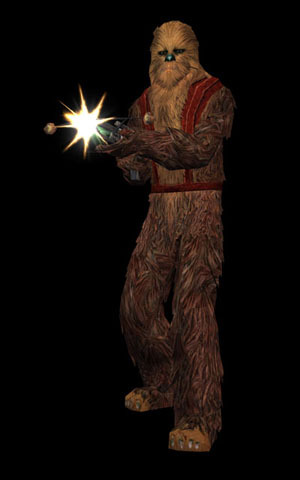 He is a very powerful ally for the first portion of the game until you start getting Jedi companions. I would keep him in my party until then. When leveling him, upgrade his strengths first. Increase his Dexterity at every opportunity and maximize the two-weapon-fighting tree as soon as possible. Power Blast, Toughness, and Implant should also be invested in. Once you have maximized those I would recommend any leftover feats be put into conditioning. Give him the two most powerful blasters you can afford, which will be Saul Karath's Sith assassin pistol in his main hand, and Cassus Fett's Heavy Pistol in his offhand and use Master Power Blast on any enemies you see. At the end of the game he will not be as powerful as having a Jedi Companion, but he will still be quite powerful with this setup, and can deal a good amount of damage to enemies. Mission will join you once you exit the outcast village. She is an okay addition to your party when you start out, and you will finally be able to have a full party. She is very weak so keep her out of melee range at all times. Use her to flank if you can, but that carries the risk of her being attacked and dying. Once you have Zaalbar it is probably better to leaver her out of your party and only swap her in to disarm mines, unless your PC is proficient at it. She quickly gets outclassed and becomes useless as you progress in the game, as her functions can be taken over by other characters easily. As she is hardly ever of use leveling is not too important, but if you build her properly she can do okay. Increase her Dexterity, and if at all possible stun your enemies, which will allow her to do loads of sneak attack damage. Since she is a pure scoundrel her attack bonus won't be too high, but you can try to give her two blasters and two weapon fighting, otherwise focus on Dueling. Make sure you maximize the Rapid shot feat tree for her to increase her sneak attack damage. If you do use her later in the game, I would not use Carth so that there are enough good blasters to go around. Usually it is not wise to have two blaster wielders in your party at the same time. She also happens to be an incompetent Pazaak Player who only plays for free. No bets. Darn. Found: Taris Lower Sewers. Mandatory. Zaalbar starts out as a powerful ally and you'll be glad once you get him in your party. He is the most powerful melee machine while on Taris, so I try to get him as soon as possible. Once he is in the party do not swap him out at least until you get Bastila. His low AC is compensated for by his huge VP pool. When leveling, I usually maximize Toughness, Flurry, and Dueling to increase his chances of survival. Increase either his Strength or Constitution when you have the opportunity. I usually don't go with two weapon fighting with him simply because there are not very many good melee weapons near the beginning of the game, and by the time that there are I don't use him anymore. 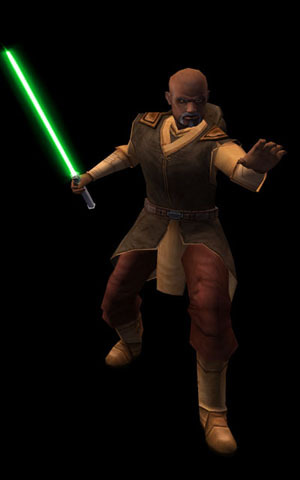 His low AC means that he dies quickly later on in the game so the Jedi are of more use when it comes to battle. Another possible variant is to invest in Conditioning instead of Toughness. Usually I do not advise people to do this as conditioning is of limited use near the beginning of the game when you will be using him most often. Also due to the fact that he is a pure scout he can have the highest overall saves of any character, making the excess unnecessary. Found: Taris Swoop Platform. Mandatory. Bastila will join your party after you rescue her from the Vulkars at the Swoop Race. She is one of the more useful characters in the game and you will likely keep her in your party most of the time she is available. 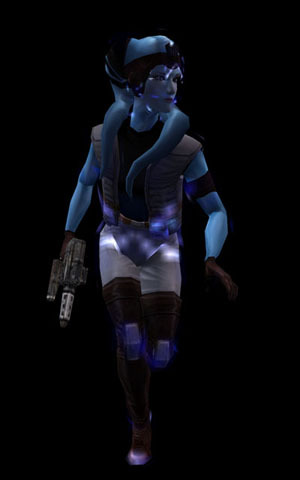 She is a well balanced character being proficient in combat, as well as force powers. However her character becomes unavailable more times than any other as she will be unavailable at least some part of the time for three planets depending on how you play. Remember this as you will need someone to fill in for her when she is unavailable. When leveling her I usually max out two-weapon-fighting and flurry. I also increase her dexterity and wisdom. Sometimes I also try to max out her Jedi defense feats, but that is not necessary. I use her force powers both for buffing and for offensive purposes. While she is not talented as a consular, she is still quite powerful nonetheless. Remember that it is best to balance all of your Jedi in your party to have various different force powers to compliment each other. For weapons I usually keep her with her double-bladed lightsaber, and upgrade it once I have enough crystals to do so. In most cases her lightsaber should take lower precedence than your character's lightsaber. She also has plenty of lines of dialog and can use affect mind on a few occasions if you fail a persuade or do not use affect mind yourself. Found: Taris Upper City North. Mandatory. T3-M4 first becomes available in Janice Nall's Droid shop after talking to Canderous about plans to leave Taris. Unfortunately he is not nearly as useful as he is made out to be. While he excels at repair and computer use he is good for little else. What I usually do when I use him is to just swap him in, use the computer and then swap him out of my party. In certain locations it is not possible to swap him in and out without leaving the area, which makes it cumbersome to use him. His usefulness in battle is quite limited, and while his flamethrower and carbonite projectors can be useful, they are nothing compared to the sheer might of Jedi force powers. When leveling him, be sure not to take blaster weapon focus, as he can be equipped with items that grant that feat automatically. I usually invest in gearhead, toughness, two-weapon fighting, and then caution in that order. Because of a shortage of good blasters in the game, I usually give him leftovers, as his skill in battle isn't all that great anyways. He also has no inter-party banter and hardly any dialogue of any sort, so that is another reason he always stays out of my party. Found: Taris Davik's Estate. Mandatory. 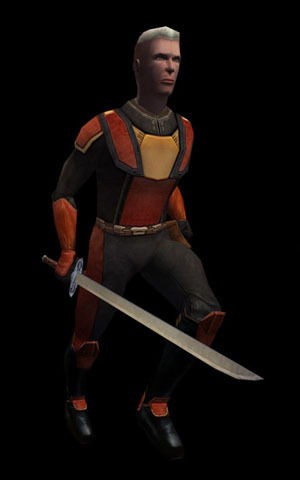 Canderous is a versatile character that will come in handy when you first get him in Davik's Estate. His high VP and natural regeneration and moderately high AC can keep him alive through difficult battles. His moderately high strength also allows him to be a relatively competent at melee combat as well. However his usefulness is short-lived for like Carth your Jedi companions will far outstrip him in usefulness soon enough. It is possible to build him to become a melee combatant or a heavy weapon user, so depending on your preference your feat selection and focus will change. 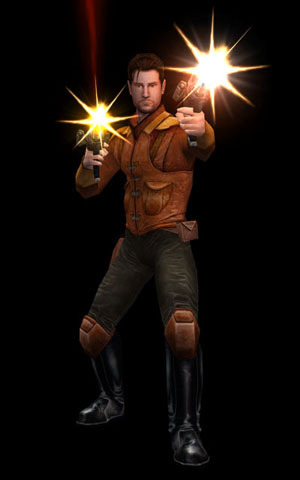 If you do not have access to the Yavin Station then it is better to go with dual wielding blasters rather than heavy weapons, which makes Carth a more useful character than Canderous. If you do have access then the Baragwin Heavy Repeating Blaster is the most powerful ranged weapon available which he can use to great effect. Since he is a soldier he should have enough feats to maximize rapid shot, toughness, implant, and conditioning. If you do go with melee weapons be sure to get melee weapon specialization, two-weapon fighting, and flurry instead. Found: Ebon Hawk, after receiving first Star Map and talking to Jedi Council. NOT Mandatory. 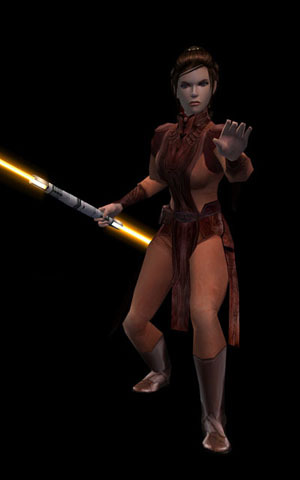 Juhani is the only Jedi Guardian that is available as a member of your party and will join you automatically if you do not kill her. I usually put her in my party along with Bastila, but once I get Jolee she takes lower precedence. Her lower FP count means she won't be using many force powers, and those that she does I mainly use for buffing. Mainly I use her as Bastila's replacement whenever she becomes unavailable. 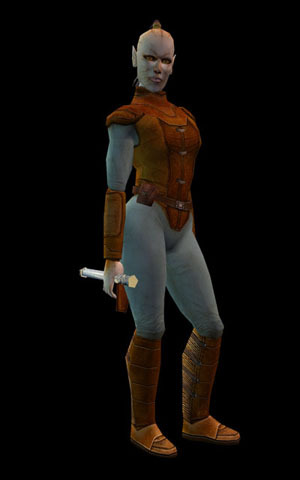 If your main character is a Consular Juhani becomes more important, as she can help hold off the hordes of enemies while you blast them from afar. You must have her in your party if you want the Erlam lightsaber crystal (which isn't all that great). For leveling, I usually balance her between strength and dexterity, and take two weapon fighting and flurry. If you want to simply use her as a meat-shield, Dueling and Power attack and a greater focus on Dexterity may be better as that increases your AC and will allow her to last longer. 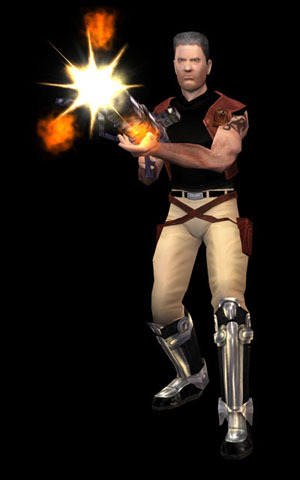 Any crystals that increase damage and attack are great for Juhani. All in all she is a good character to have in your party. Found: Tatooine Droid Shop. NOT Mandatory. While HK-47 is one of my favorite characters to talk to, he is unfortunately one of the less useful characters. HK-47 is vital if you wish to pursue a peaceful ending to the Sand people problem on Tatooine, which is ironic considering how blood-thirsty HK-47 is. Otherwise he is not a mandatory character and you are not required to purchase him. 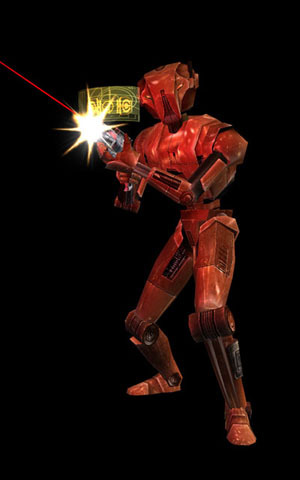 If you do plan on using HK-47 in your party make sure that you have at least 17 in repair, so that you can fix him up, giving him some great bonuses. 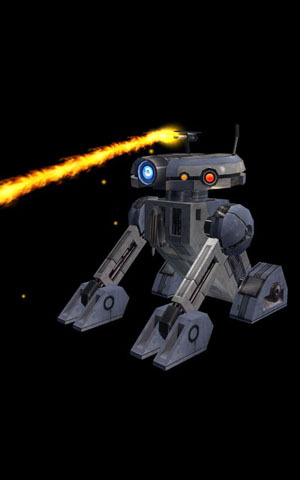 It is unfortunate that he doesn't receive many feats, which really cripples his capacity to be a powerhouse droid. Usually I invest in rapid shot and toughness and give him the Baragwin Ion-X rifle. This is an okay setup, but Canderous and Carth both do more damage than he does even against droids. The only thing going for him is his regeneration and high VP, Canderous is far more useful in that regard, besides which the Heal force power does not work on droids, further decreasing his usefulness. Therefore after all things are considered I only use HK-47 on Tatooine for one quest, after which he stays on the Ebon Hawk permanently. Jolee is my favorite character out of all of the choices available. Not only does he have a great sense of humor, he is actually very useful in your party. Because his alignment is close to being gray, he can use dark force powers without penalty, making him a great addition to your party. His usefulness increases as he levels up and new more powerful force powers become available. When leveling him up I usually have him focus on dueling and Jedi defense to increase his longevity, and wisdom to make his force powers that much more powerful. Unless your PC is a dark consular, it is unlikely that they will have dark sided force powers, so I usually give Jolee Kill, and force storm. This makes him great for clearing out large numbers of enemies in a relatively short period of time. The only time I ever take him out of my party is if I need another person present to complete their side-quest. Even if your main character is a consular themselves, their combined power will decimate any enemy within seconds, making two fighters unnecessary. For his lightsaber, I usually try to increase attack and bonus blaster bolt deflection. I would save the Mantle of the Force crystal for your Main Character (without which it is imposssible to get force regeneration on a lightsaber).